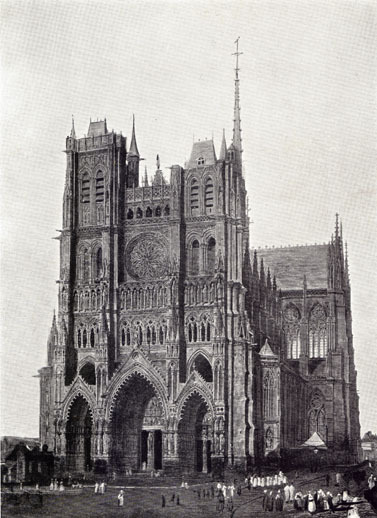 Amiens: Cathedral in Beautiful Buildings in France and Belgium by C. Harrison Townsend, pre-WWI picture by C. Wild. From, Beautiful Buildings in France & Belgium, Including many which have been destroyed during the war. Reproductions in Colour and Monochrome from rare old Prints and Drawings, by and after Prout, Boys, Coney, W. Callow, David Roberts, C. Wild and others, with descriptive notes by C. Harrison Townsend, F.R.I.B.A. ; New York: The Hubbell Publishing Co., 1916; pp. 22-25. HE reproduction of C. Wild’s sketch shows us the West Front of what is perhaps the most imposing Gothic church in France. Stern faces bleared with immemorial watch. all leading up to and dominated by the majestic figure, in the middle arch, of the 24 “Beau Dieu d’Amiens,” one of the finest works of the great XIIIth century sculptors. The Cathedral was planned by Robert Luzarches, and was carried out, almost contemporaneously with those of Rheims and Chartres, chiefly between 1220 and 1288, the side chapels being somewhat later in date. The West Front is flanked by two square towers without spires, which, however, are so small in proportion to the immense building behind as to emphasize the heaviness of the latter. This effect of overweight is not relieved by the beauty of the slender spire, which rises, at the crossing of the nave and transepts, to a height of 420 feet from the ground. The interior, only exceeded in height by Beauvais (see page 50), contains beautifully wrought choir-stalls of the early XVIth century, and a highly interesting choir-screen or jubé in the flamboyant style.